Connor Hellebuyck made 25 saves for his fifth shutout of the season as the Winnipeg Jets blanked the Colorado Avalanche 3-0 on Saturday. Connor Hellebuyck appreciates his Winnipeg teammates sacrificing their bodies to help him look good. Hellebuyck made 25 saves for his fifth shutout of the season as the Jets blanked the Colorado Avalanche 3-0 on Saturday. "They're bringing it every night and you can tell," Hellebuyck said. "Guys are getting a little banged up, that means they're blocking shots and doing the right things. My hat is off to my teammates." Patrik Laine scored his team-leading 24th goal, rookie Jack Roslovic was credited with his second and Nikolaj Ehlers put his 20th into an empty net for the Jets (31-13-9). Blake Wheeler added a pair of assists as Winnipeg extended its point streak to seven games (5-0-2). It was the third game of a season-high, 10-game homestand (2-0-1). Semyon Varlamov was back in net for Colorado. He missed 10 games in total with an injury and backed up Jonathan Bernier in the Avalanche's overtime win in Edmonton on Thursday. The veteran netminder stopped 29 shots as the Avalanche (28-19-4) wrapped up a season-long, six-game road trip with the loss (2-3-1). "It was great to see him back in the net and he was our best player tonight," Colorado coach Jared Bednar said. Winnipeg led 1-0 after the first period and kept that edge until a Wheeler shot bounced off Roslovic and went up and over Varlamov into the net at 5:17 of the third. Laine scored 2:27 into the opening period on a play that's become familiar to Winnipeg fans. Wheeler threaded a pass through defenders across the front of the net to Laine on the left and he one-timed his 13th power-play marker past Varlamov on his blocker side. Winnipeg lost veteran forward Matt Hendricks to an upper-body injury early in the first. Coach Paul Maurice said later it didn't look significant. "In that we lost Matt so early and you get to a shorter bench and a kind of a grinding game, we handled it pretty darn well," Maurice said. The Jets had three shots hit the post in the scoreless second period, while the Avalanche had a 2-on-0 while shorthanded. Matt Nieto and Gabriel Bourque went in alone on Hellebuyck, but Bourque's high shot missed the net. Hellebuyck had his tongue planted firmly in his cheek when asked about the duo bearing down on him. "I think I might have intimidated [Bourque] a little bit," he said with a grin. 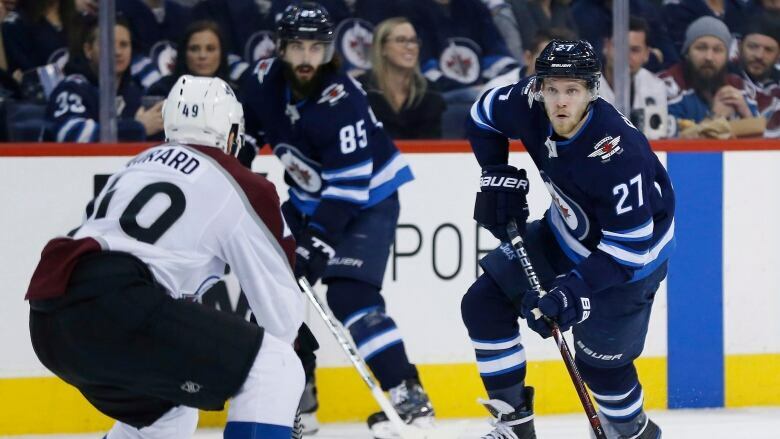 The Avalanche had a power play with 4:43 left in the third when Jets centre Bryan Little was called for hooking, but Hellebuyck made a couple of stops, a few shots were blocked and Ehlers scored into the empty net with 18 seconds left. Winnipeg hosts Arizona on Tuesday. Colorado heads home to take on San Jose the same day.